The Black Stone of Mecca is a crystal stone that Muslims believe came from heaven to earth through Archangel Gabriel. It is the centerpiece of a sacred ritual called tawaf that many pilgrims perform on hajj (pilgrimage) to Mecca, Saudi Arabia — a pilgrimage that Islam requires its faithful to make at least once in their lifetimes, if at all possible. The stone is located inside the Kaaba, a chamber in the center of the Masjid al-Haram mosque. Muslims believe that the first human being, Adam, originally received the black stone from God and used it as part of an altar for worship. Then, Muslims say, the stone was hidden for many years on a mountain, until Gabriel, the archangel of revelation, brought it to the Prophet Abraham to use in another altar: the altar where God tested Abraham's faith by calling him to sacrifice his son Ishmael (unlike Jews and Christians, who believe that Abraham laid his son Isaac on the altar, Muslims believe that it was Abraham's son Ishmael instead). What Kind of Stone Is It? Since the stone's caretakers haven't allowed any scientific tests to be performed in the stone, people can only speculate on what type of stone it is — and several popular theories exist. One says that the stone is a meteorite. Other theories propose that the stone is basalt, agate, or obsidian. 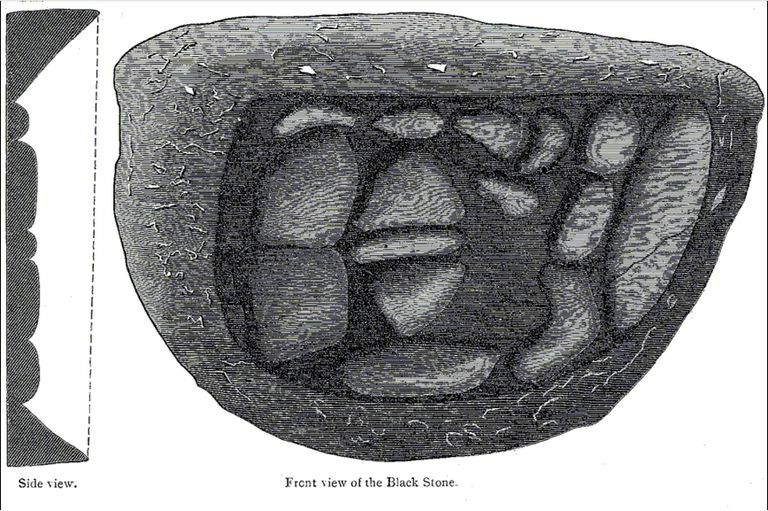 In his book Major World Religions: From Their Origins to the Present, Lloyd V. J. Ridgeon comments: "Regarded by some as a meteorite, the black stone symbolizes God’s right hand, thus touching or pointing to it reenacts the covenant between God and man, that is, man’s acknowledgment of God’s lordship." The black stone was originally white, but turned black from being in a fallen world where it absorbed the effects of humanity's sins, Muslim tradition says. In Pilgrimage, Davidson and Gitlitz write that the black stone is "the remains of what Muslims believe is the altar that Abraham built. Popular legends say that the black stone is a meteorite worshiped by pre-Muslims. Some believe that the ancient stone was brought from a nearby mountain by the archangel Gabriel and that it was originally white; its black color comes from it having absorbed people’s sins." The stone, which is about 11 inches by 15 inches in size, was damaged over the years and broke up into several pieces, so it is now held together inside a silver frame. Pilgrims may kiss or lightly touch it today. The sacred ritual associated with the black stone is called tawaf. In their book Pilgrimage: From the Ganges to Graceland: An Encyclopedia, Volume 1, Linda Kay Davidson and David Martin Gitlitz write: "In a rite called tawaf, which they perform three times during the hajj, they circumambulate the Kaaba counterclockwise seven times. ... Each time pilgrims pass the black stone they recite a prayer from the Qur’an: 'In the name of God, and God is supreme.' If they can, pilgrims approach the Kaaba and kiss it ... or they make a gesture of kissing the Ka’ba each time if they cannot reach it." When he used the black stone in the altar he built to God, Abraham used it "as a mark to indicate the beginning and end points of pilgrims' circumambulations," write Hilmi Aydın, Ahmet Dogru, and Talha Ugurluel in their book The Sacred Trusts. They continue by describing the stone's role in tawaf today: "One is required to either kiss the stone or salute it from afar on each of the seven circumambulations." The circular paces that pilgrims make around the black stone are symbolic of how angels constantly circle around God's throne in heaven, writes Malcolm Clark in his book Islam For Dummies. Clark comments that the Kaaba "is believed to be a replica of the house of God in the seventh heaven, where God’s throne is located. Worshipers, in circling around the Kaaba, duplicate the movements of the angels continuously circling around the throne of God."